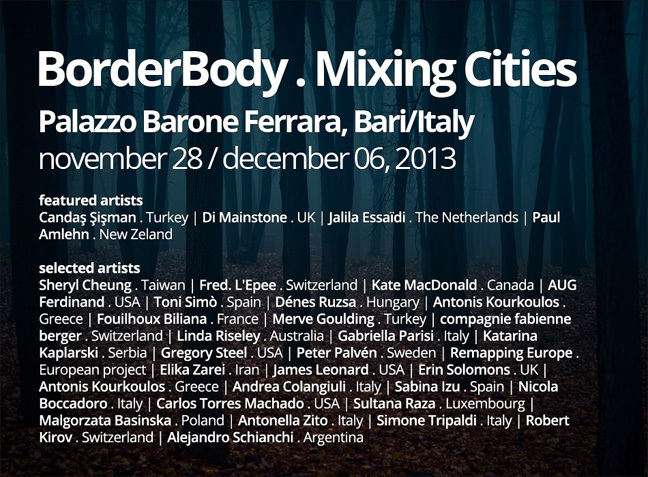 “BorderBody – Mixing Identities” international art festival of photography, video art, installation and performing art will be held at the prestigious Palazzo Barone Ferrara in Bari (Italy) from the 13 to the 21 of February 2014. “BorderBody” exhibitions cycle is conceived as a diffused and nomadic festival in different places of the world. “Mixing Identities”, the second chapter of this 3-event cycle, is focused on the hybridization of social identities. In contemporary societies boundaries are getting more and more fleeting, and also the identity, that makes each person or place a recognizable entity, turns out fluid and multiple. Cultural, religious, ethnic borders become changeable too. This change, this mutation has allowed to cross the inside of the identities, creating new possible crossings, new blends. There is no more limit between an identity and the other one but it is possible to walk, to cross a passage and to find oneself halfway through it, in a non-place, in a non-identity. 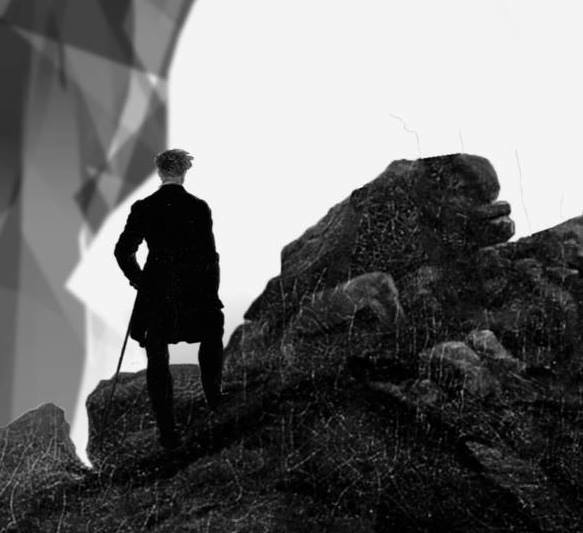 Films projection of “In Exilum”, “Contemporary Man”, “Scapegrace”. AXIAL art_meets has been conceived to accommodate different kinds of artistic expression in a physical and virtual space, insisting on the new conditions that are needed to exhibit the latest creations, to promote various cultural encounters and generate a new area of interest, capable of attracting private collectors. The space is exclusive and closed. It can only be accessed by means of a personal invitation or through a telephone or mail personal request. To request a visit of the space and access to the works of the artists represented by AXIAL art_meets entails a willingness to buy their works or other financial compensation to help the maintenance of culture and contemporary art. The program consists on four annual exhibitions, either individual or collective, which will be previously announced on the website before each opening. Exhibitions can be watched free of charge on line. The purchase of the various pieces displayed, publications, artist books, limited editions can also be made on line. During the event will be presented the stunning digital videos “Flux” and “Eff-Lux” by Turkish artist Candaş Şişman; the amazing project “Human Harp” by London based artist Di Mainstone, and “Bulletproof skin” video by the founder of “BioArt Laboratories” Jalila Essaïdi. In the exhibition area it will be possible to listen to the sound artwork “Interzone” by Paul Amlehn, who has collaborated on music projects with musicians from the bands of Lou Reed, David Bowie, Laurie Anderson, Tom Waits, and others, and with members of the Kronos Quartet, and Philip Glass Ensemble. BorderBody – International Art Festival Photography, Video Art, Painting, Installation and Performing Art will be held in Almeria (Spain), at MECA Mediterráneo Centro Artístico, during the 14th and 28th of November,2013.